The International Mountain Bicycling Association has named the Switchgrass Mountain Bike Trail an 'Epic', cementing the trail's growing reputation as one of the best mountain biking destinations in the nation. After opting out of the federal Recreational Trails Program, which would have provided $1.3 million in dedicated funding for trails in Kansas, the Kansas Department of Transportation announced that Kansas will instead devote $2 million to trails in the state. Although camping is not permitted on the Prairie Spirit Trail itself, there are a number of camping options near various points along the 51-mile rail-trail corridor. 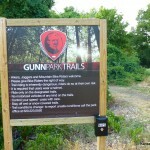 Some photos and impressions from a test ride at the new Gunn Park Trails in Fort Scott, Kansas. Sweet! Symphony In The Flint Hills Informational Campaign A Success; Iola Prairie Spirit Trail Section Completed; Kansas River To Be Dedicated As National Recreation Water Trail; Sunflower Santa Fe Trail Segment Dedicated; Best Hiking Trails In Kansas; more. In Marysville, Kansas, members of the local FFA (Future Farmers of America) are helping to build the Blue River Rail Trail, despite opposition from local and statewide farm organizations. Is this perhaps a hopeful sign, an indication that the next generation of rural residents are embracing all that trails have to offer?